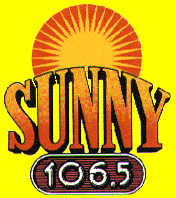 Perhaps you were vacationing in the Grand Strand, driving around Myrtle Beach or anywhere up and down US 17, you might have been listening to those Golden Oldies on Sunny 106.5. The signal was pretty impressive, you could hear this all the way down to Charleston and up north of Myrtle Beach thanks to a transmitter that was not quite mid way in between both cities. This day, Michael Parnell is filling in for Brian White on the PM Drive show. This was recorded between 3:32 – 4:17 pm.